For the past few months we've been working on a new part of the Football Web Pages system which will host web sites for clubs. 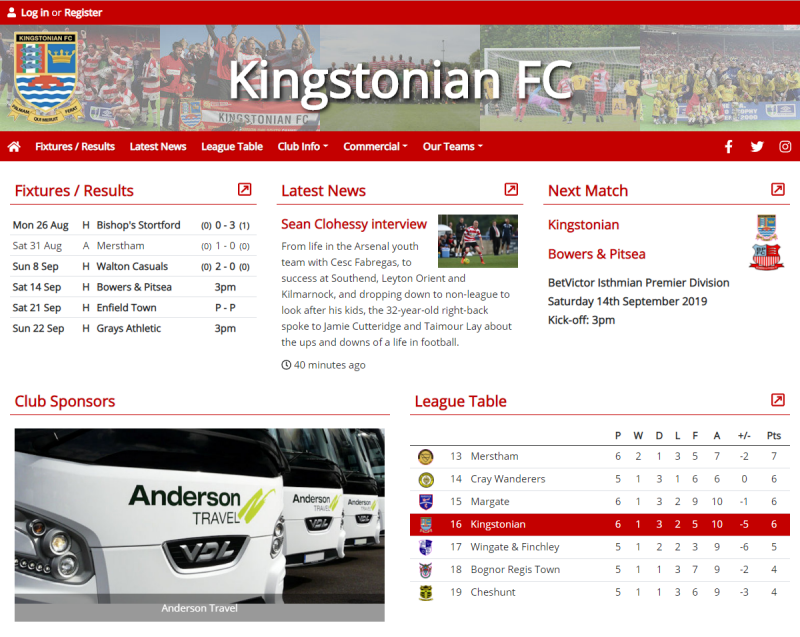 We've recently launched our first site for Kingstonian FC (see below), have a few other clubs helping to test things out, and are now happy for other clubs to sign up for their own free trial. The sites are fully responsive and configurable in many ways. They use the FWP engine to auto-populate pages such as league tables and fixtures/results for the first team. You can also add additional teams (reserves, youth, ladies etc) and manually add fixture lists and league tables. You can easily manage the news items on your site, and instantly share those to your Facebook / Twitter accounts from the bespoke CMS. We're currently completing the backend of the site to allow clubs to manage their payments and we'll soon be making a start on providing an online club shop. If you're thinking of moving your site away from your current hosts do please have a look at the Kingstonian site (see below) and sign up for a free trial with no obligation to continue!